Burnley came from a goal down to secure victory over Morecambe in the second round of the Carling Cup. Phil Jevons guided in an eight-yard shot to give the home side the lead but Chris Eagles fired in an equaliser after Steve Thompson's lay off. Laurence Wilson's free-kick struck the Burnley crossbar before the visitors took the lead with a Thompson penalty after Darren Moss brought down Eagles. Kevin McDonald's deflected shot from long range completed Burnley's win. 90:00+3:12 Centre by Steven Thompson, Paul Scott manages to make a clearance. 90:00+2:37 The ball is sent over by Mark Duffy, save by Lee Grant. 90:00+2:06 Handball decision goes against Laurence Wilson. Wade Elliott takes the free kick. 90:00+1:46 Defending throw-in by Laurence Wilson (Morecambe). 90:00+1:10 Substitution Wes Fletcher on for Jay Rodriguez. 90:00+0:53 Shot from just outside the box by Jay Rodriguez goes over the crossbar. 90:00+0:44 Handball by Paul Mullin. Direct free kick taken by Kevin McDonald. 89:59 Attacking throw-in by Laurence Wilson (Morecambe). 89:44 Foul by Leon Cort on Paul Mullin, free kick awarded. Garry Hunter takes the free kick. 89:02 David Edgar produces a cross, Andy Parrish makes a clearance. 88:37 The assistant referee flags for offside against Paul Mullin. Free kick taken by Clarke Carlisle. 87:49 Defending throw-in by Paul Scott (Morecambe). 87:25 Defending throw-in by Paul Scott (Morecambe). 86:21 Defending throw-in by Laurence Wilson (Morecambe). 85:48 The ball is swung over by Laurence Wilson, Paul Mullin takes a shot. Save by Lee Grant. 84:43 Substitution Chris Eagles leaves the field to be replaced by Michael King. 84:43 The assistant referee signals for offside against Phil Jevons. Lee Grant restarts play with the free kick. 84:04 Chris Shuker delivers the ball, Header on goal by Phil Jevons from inside the box goes harmlessly over the target. 83:54 Attacking throw-in by Laurence Wilson (Morecambe). 82:54 GOAL - Kevin McDonald:Morecambe 1 - 3 Burnley Kevin McDonald gets on the score sheet with a goal from long range high into the middle of the goal. Morecambe 1-3 Burnley. 82:25 Goal kick taken long by Barry Roche (Morecambe). 81:49 The offside flag is raised against Paul Mullin. Lee Grant takes the indirect free kick. 81:41 Goal kick taken short by Barry Roche (Morecambe). 81:37 Chris Eagles sends in a cross. 81:07 Unfair challenge on Garry Hunter by Wade Elliott results in a free kick. Free kick crossed by Mark Duffy, Leon Cort manages to make a clearance. 80:41 Attacking throw-in by Laurence Wilson (Morecambe). 80:41 Substitution Stewart Drummond joins the action as a substitute, replacing Craig Stanley. 80:35 Attacking throw-in by David Edgar (Burnley). 80:07 Substitution Garry Hunter comes on in place of Andrew Fleming. Correction - 79:31 Shot from 20 yards from Chris Eagles. Save by Barry Roche. 79:31 Effort from 20 yards by Chris Eagles. Save by Barry Roche. 78:44 David Edgar is flagged offside by the assistant referee. Free kick taken by Barry Roche. 77:49 Booking Mark Duffy is booked. 77:37 Foul by Mark Duffy on Chris Eagles, free kick awarded. Clarke Carlisle takes the free kick. 77:28 The ball is crossed by Laurence Wilson, clearance by David Edgar. 76:58 Goal kick taken long by Barry Roche (Morecambe). 76:53 Kevin McDonald produces a cross. 75:49 Booking Craig Stanley is given a yellow card. 75:33 Free kick awarded for a foul by Craig Stanley on Wade Elliott. David Edgar restarts play with the free kick. 74:31 Unfair challenge on Phil Jevons by Clarke Carlisle results in a free kick. Andy Parrish takes the free kick. 73:58 Goal kick taken long by Lee Grant (Burnley). 73:44 Phil Jevons produces a cross, Headed effort from inside the area by Paul Mullin misses to the left of the goal. 72:55 Andy Parrish concedes a free kick for a foul on Steven Thompson. Chris Eagles produces a cross, Jay Rodriguez takes a shot. Save made by Barry Roche. 72:36 Chris Shuker sends in a cross, David Edgar gets a block in. 72:33 Attacking throw-in by Laurence Wilson (Morecambe). 71:50 Substitution Paul Mullin joins the action as a substitute, replacing Darren Moss. 71:28 Unfair challenge on Laurence Wilson by Jack Cork results in a free kick. Barry Roche takes the free kick. 71:20 Defending throw-in by Laurence Wilson (Morecambe). 70:55 The assistant referee signals for offside against Phil Jevons. Lee Grant takes the free kick. 70:01 Craig Stanley takes the outswinging corner, clearance made by Steven Thompson. 69:37 Wade Elliott challenges Andrew Fleming unfairly and gives away a free kick. Free kick taken by Darren Moss. 68:35 Defending throw-in by Darren Moss (Morecambe). 67:36 Kevin McDonald concedes a free kick for a foul on Andrew Fleming. Direct free kick taken by Chris McCready. 67:10 Paul Scott concedes a free kick for a foul on Jack Cork. Direct free kick taken by Clarke Carlisle. 66:38 Substitution (Burnley) makes a substitution, with Kevin McDonald coming on for Richard Eckersley. 66:28 Steven Thompson produces a right-footed shot from just outside the box that goes wide left of the target. 65:23 Craig Stanley crosses the ball in from the free kick. 65:23 Booking Jay Rodriguez is booked. 65:03 Free kick awarded for a foul by Steven Thompson on Darren Moss. 64:13 Unfair challenge on Laurence Wilson by Richard Eckersley results in a free kick. Free kick crossed left-footed by Craig Stanley from left wing, clearance made by Leon Cort. 63:31 Defending throw-in by Laurence Wilson (Morecambe). 63:13 Goal kick taken long by Lee Grant (Burnley). 62:36 The ball is sent over by Chris Shuker. 62:22 Defending throw-in by Darren Moss (Morecambe). 61:33 Shot on goal comes in from Craig Stanley from the free kick. 61:33 Booking Richard Eckersley booked. 61:22 The referee penalises Richard Eckersley for handball. 60:56 Attacking throw-in by Chris Shuker (Morecambe). 60:27 GOAL - Steven Thompson:Morecambe 1 - 2 Burnley Placed penalty scored by Steven Thompson. Morecambe 1-2 Burnley. 59:24 Penalty awarded for an unfair challenge on Chris Eagles by Darren Moss. 58:27 Craig Stanley fouled by Jay Rodriguez, the ref awards a free kick. Free kick taken by Andy Parrish. 57:46 Goal kick taken long by Barry Roche (Morecambe). 57:28 Chris Eagles delivers the ball, Steven Thompson has an effort at goal from close range which goes wide of the left-hand upright. 56:13 Defending throw-in by Richard Eckersley (Burnley). 55:29 Free kick awarded for an unfair challenge on Chris Shuker by Richard Eckersley. Direct free kick taken by Laurence Wilson. 52:08 The ball is swung over by Phil Jevons, Lee Grant makes a save. 51:44 Jay Rodriguez challenges Laurence Wilson unfairly and gives away a free kick. Free kick taken by Craig Stanley. 50:40 Attacking throw-in by Darren Moss (Morecambe). 50:11 Chris Eagles takes the chance to get an effort at goal. Barry Roche makes a save. 49:20 Attacking throw-in by Richard Eckersley (Burnley). 49:01 The ball is delivered by Wade Elliott, clearance made by Andy Parrish. 47:31 The assistant referee flags for offside against Phil Jevons. Lee Grant takes the indirect free kick. 47:08 Defending throw-in by Brian Easton (Burnley). 46:34 Attacking throw-in by Brian Easton (Burnley). 46:11 Attacking throw-in by Richard Eckersley (Burnley). 45:47 Outswinging corner taken right-footed by Chris Eagles from the right by-line to the near post, clearance by Craig Stanley. 45:37 Attacking throw-in by Richard Eckersley (Burnley). 45:15 Attacking throw-in by Richard Eckersley (Burnley). 45:00+1:26 Outswinging corner taken right-footed by Chris Eagles, Jay Rodriguez has a headed effort at goal from close range which goes wide of the left-hand post. 45:00+1:17 The ball is crossed by Steven Thompson, Andy Parrish manages to make a clearance. 45:00+0:15 Free kick awarded for an unfair challenge on Chris Eagles by Mark Duffy. Clarke Carlisle takes the free kick. 44:57 Defending throw-in by Laurence Wilson (Morecambe). 44:19 Mark Duffy takes a shot. Save by Lee Grant. 44:07 Attacking throw-in by Darren Moss (Morecambe). 44:03 Attacking throw-in by Darren Moss (Morecambe). 43:00 Goal kick taken long by Barry Roche (Morecambe). 41:57 Foul by Mark Duffy on Brian Easton, free kick awarded. Chris Eagles crosses the ball, Effort on goal by Clarke Carlisle from inside the penalty area goes harmlessly over the bar. 40:26 Attacking throw-in by Darren Moss (Morecambe). 40:05 Defending throw-in by Laurence Wilson (Morecambe). 39:14 The ball is sent over by Mark Duffy. 38:34 Corner taken by Craig Stanley, clearance made by David Edgar. 37:30 Phil Jevons fouled by Richard Eckersley, the ref awards a free kick. Phil Jevons fires a strike on goal direct from the free kick. 36:44 Free kick awarded for an unfair challenge on Chris Eagles by Paul Scott. Chris Eagles produces a shot on goal direct from the free kick. 36:44 Booking Paul Scott is booked. 35:45 Attacking throw-in by Richard Eckersley (Burnley). 34:44 Defending throw-in by Brian Easton (Burnley). 34:15 Defending throw-in by Brian Easton (Burnley). 33:03 Steven Thompson challenges Andy Parrish unfairly and gives away a free kick. Barry Roche takes the direct free kick. 32:48 Defending throw-in by Richard Eckersley (Burnley). 31:28 Defending throw-in by Brian Easton (Burnley). 31:25 Goal kick taken long by Lee Grant (Burnley). 31:21 The ball is crossed by Chris Shuker. 29:42 Assist on the goal came from Steven Thompson. 29:42 GOAL - Chris Eagles:Morecambe 1 - 1 Burnley Chris Eagles grabs a goal from inside the penalty area to the bottom right corner of the goal. 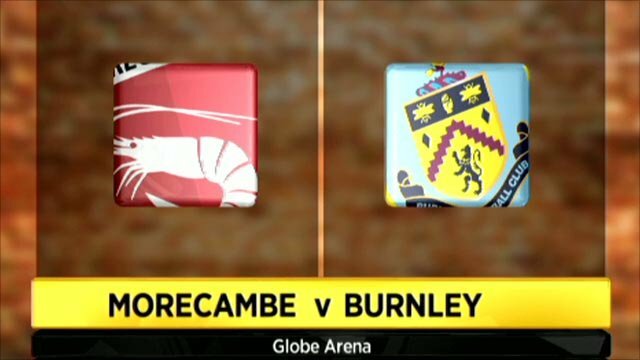 Morecambe 1-1 Burnley. 29:01 The ball is swung over by Wade Elliott, Chris McCready makes a clearance. 28:23 Attacking throw-in by Richard Eckersley (Burnley). 27:48 Goal kick taken long by Lee Grant (Burnley). 27:19 Chris McCready produces a cross, Effort from inside the area by Craig Stanley misses to the right of the goal. 27:12 A cross is delivered by Craig Stanley, Clarke Carlisle makes a clearance. 26:40 Outswinging corner taken right-footed by Craig Stanley played to the near post. 26:32 Chris Shuker produces a cross, Wade Elliott makes a clearance. 25:22 Attacking throw-in by Brian Easton (Burnley). 24:56 Andrew Fleming concedes a free kick for a foul on Jack Cork. Clarke Carlisle takes the direct free kick. 24:31 Centre by Phil Jevons, David Edgar makes a clearance. 24:23 Defending throw-in by Laurence Wilson (Morecambe). 23:19 The referee blows for offside. Lee Grant takes the free kick. 22:51 Goal kick taken long by Lee Grant (Burnley). 22:25 Mark Duffy decides to take the corner short. 21:47 Centre by Paul Scott, Phil Jevons has an effort at goal from 6 yards. Blocked by Clarke Carlisle. 21:28 Attacking throw-in by Darren Moss (Morecambe). 20:55 Richard Eckersley concedes a free kick for a foul on Chris Shuker. The free kick is swung in right-footed by Craig Stanley, clearance made by Brian Easton. 20:39 Effort from 20 yards by Chris Eagles. Save by Barry Roche. 20:19 Attacking throw-in by Brian Easton (Burnley). 19:57 Attacking throw-in by Brian Easton (Burnley). 19:14 Goal kick taken long by Lee Grant (Burnley). 19:08 The ball is sent over by Chris Shuker. 18:48 Steven Thompson gives away a free kick for an unfair challenge on Paul Scott. Direct free kick taken by Paul Scott. 17:14 Foul by Craig Stanley on Jay Rodriguez, free kick awarded. Direct free kick taken by Leon Cort. 17:00 Goal kick taken long by Barry Roche (Morecambe). 16:33 The ball is swung over by Wade Elliott, Header by Jay Rodriguez from deep inside the penalty area misses to the left of the target. 15:48 Attacking throw-in by Brian Easton (Burnley). 13:41 Defending throw-in by Laurence Wilson (Morecambe). 13:22 Free kick awarded for a foul by Craig Stanley on Richard Eckersley. Free kick taken by Clarke Carlisle. 11:32 Assist by Mark Duffy. 11:32 GOAL - Phil Jevons:Morecambe 1 - 0 Burnley Phil Jevons grabs a goal from close range low into the middle of the goal. Morecambe 1-0 Burnley. 10:33 The referee blows for offside. Barry Roche takes the indirect free kick. 10:13 The ball is swung over by Jack Cork, Andrew Fleming makes a clearance. 8:20 The ball is sent over by Chris Eagles, save by Barry Roche. 5:33 The referee blows for offside. Free kick taken by Lee Grant. 5:02 Free kick awarded for a foul by Wade Elliott on Craig Stanley. Barry Roche takes the direct free kick. 4:48 Attacking throw-in by Chris Eagles (Burnley). 3:53 The official flags Chris Shuker offside. Lee Grant takes the indirect free kick. 3:35 Unfair challenge on Paul Scott by Wade Elliott results in a free kick. Direct free kick taken by Barry Roche. 3:28 Wade Elliott produces a cross. 2:51 The offside flag is raised against Phil Jevons. Lee Grant takes the indirect free kick. 2:29 Chris McCready fouled by Steven Thompson, the ref awards a free kick. Andy Parrish takes the free kick. 1:50 Defending throw-in by Richard Eckersley (Burnley). 1:00 Attacking throw-in by Brian Easton (Burnley).